1 Calculations based on Census Current Population Survey data by Barry Hirsch and David MacPherson, available online at http://www.trinity.edu/bhirsch/unionstats. 2 1965 P.A. 166, Mich. Comp. Laws §§408.551 et seq. 3 West Ottawa Public Schools v. C. Patrick Babcock, 107 Mich. App. 237, 309 N.W.2d 200 (1979). 8 Jack Finn and Georgia Harris, Michigan Department of Labor and Economic Growth/Wage and Hour Division, telephone interview, March 23, 2006. 11 Mass. Gen. Laws, chapter 149 §§26 et seq. ; N.J. Stat. §§34:11-56:25–34:11-56:44; Ohio Rev. Code §4115.03. 12 State of New York Commission of Investigation, The New York State Prevailing Wage Law: An Investigative Analysis (December 1983), 10–18. 13 Armand Thieblot, Prevailing Wage Legislation (Philadelphia: University of Pennsylvania, 1986), 152–53. 14 Tenn. Code §§12-4-401 et seq. 15 Ohio Legislative Service Commission, "‘Members Only’ Brief: Prevailing Wage Laws," February 25, 2005, 10–14, available online at http://www.lsc.state.oh.us/membersonly/126prevailingwagelaws.pdf. 17 29 C.F.R. 1.1 et seq. 18 Hamid Azari-Rad, ed., Economics of Prevailing Wage Laws, Alternative Voices in Contemporary Economics (Aldershot, UK: Ashgate, 2005), 14–15. 20 Armand Thieblot, "The Twenty-Percent Majority: Pro-Union Bias in Prevailing Rate Determinations," Journal of Labor Research. 26, no. 1 (Winter 2005): 99–134. 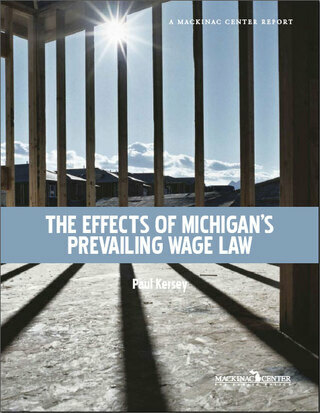 21 Richard Vedder, Michigan’s Prevailing Wage Law and Its Effects on Government Spending and Construction Employment (Midland, Mich.: Mackinac Center for Public Policy, September 1999), 3–4. 22 Hamid Azari-Rad, ed., Economics of Prevailing Wage Laws, 39–40. 24 Armand Thieblot, "A New Evaluation of Impacts of Prevailing Wage Repeal," Journal of Labor Research, vol. 17, no. 2 (Spring 1996): 307–09. 25 Leo Troy and Neil Sheflin, U.S. Union Sourcebook, 1st ed. (West Orange, N.J.: IRDIS, 1985), 3–15. 26 Calculations based on Census Current Population Survey data by Barry Hirsch and David MacPherson, available online at http://www.trinity.edu/bhirsch/unionstats. 27 Daniel Kessler and Lawrence Katz, "Prevailing Wage Laws and Construction Labor Markets," Industrial and Labor Relations Review 54, no. 2 (January 2001): 259–74. 29 PAS Inc., Merit Shop Survey, 2004 and 2005; and Michigan Department of Labor and Economic Growth, Wage and Hour Division, Prevailing Wage Rates for State Funded Projects, available at http://www.dleg.state.mi.us/bwuc/bsr/wh/whc_tbl_2005.htm. All rates listed here include both base pay and fringes, unless otherwise noted. 34 Calculations by the Mackinac Center for Public Policy, based on U.S. Department of Labor, Bureau of Labor Statistics, Metropolitan Area Occupational Employment and Wage Estimates, 2005; and Michigan Department of Labor and Economic Growth, Prevailing Wage Determinations, 2005. 35 City of Detroit Finance Department, City of Detroit Ordinance 45-98. 36 PAS Inc., Merit Shop Survey. 37 Michigan Department of Labor and Economic Growth, Wage and Hour Division, Prevailing Wage Rates for State Funded Projects. 38 U.S. Department of Labor, Bureau of Labor Statistics, Metropolitan Area Occupational Employment and Wage Estimates. 39 This is a reasonably generous estimate, at least by the standards of the construction industry in the Detroit area. With a few exceptions, fringe benefits as a percentage of base pay range from the teens to the low 30s in both the union and nonunion sector. PAS Inc., Merit Shop Survey; U.S. Department of Labor, Prevailing Wage Determinations, General Decision MI20030081, effective January 20, 2006. 40 U.S. Department of Labor, Bureau of Labor Statistics, OES Occupational Employment and Wage Estimates, Michigan. 41 Source: Mackinac Center calculations based on U.S. Census Bureau, 2002 Economic Census, Construction Industry Series, Table 3, 3. 42 See U.S. Census Bureau, 2002 Economic Census, Construction Industry Series, A3., Appendix A. 44 U.S. Department of Labor, Bureau of Labor Statistics, Occupational Employment Survey, 2004. 45 Hamid Azari-Rad, ed., Economics of Prevailing Wage Laws, 181–83. 46 Armand Thieblot, "A New Evaluation of Impacts of Prevailing Wage Law Repeal," 310. 48 "Prevailing Wage Exemption Provides Schools with Lower Costs, Higher Quality Education," Buckeye Institute for Public Policy, May 1, 2000, available online at http://www.buckeyeinstitute.org/article/509. 49 Ohio Legislative Service Commission, S.B. 102 Report: The Effects of the Exemption of School Construction Projects from Ohio’s Prevailing Wage Law, May 20, 2002, 11. 50 Michigan Department of Labor and Economic Growth, Wage and Hour Division, Prevailing Wage Reports for State Funded Projects. 51 Ohio Legislative Service Commission, S.B. 102 Report, 9. 53 Richard Vedder, Michigan’s Prevailing Wage Law, 14. 54 Author’s calculations based on U.S. Census Bureau, 2002 Economic Census, Construction Industry Series, Commercial Building Construction, tables 2 and 3. 55 Richard Vedder, Michigan’s Prevailing Wage Law, 14. 56 Richard Vedder, Michigan’s Prevailing Wage Law, 7–11. 57 Sarah Dunn, John M. Quigley, and Larry A Rosenthal, "The Effects of Prevailing Wage Requirements on the Cost of Low-Income Housing," Industrial and Labor Relations Review 59, no. 1 (October 2005): 141–57. 58 Ohio Legislative Service Commission, S.B. 102 Report, 22–25. 61 U.S. Census Bureau, Compendium of Government Finances, 2002, 115; U.S. Census Bureau, Statistical Tables, Public Elementary-Secondary Education Finances: 2001–02, table 9. 62 Armand Thieblot, "The Twenty-Percent Majority," 99–134. 63 Federal Highway Administration, Highway Statistics 2002, Table SF 21: State Funding for Highways – Summary, available online at http://www.fhwa.dot.gov/policy/ohim/hs02/sf21.htm. 64 Michigan Department of Transportation, State Long-Range Transportation Plan 2005-2030: Finance Technical Report, 2006, 5. 65 Shirley Ybarra, former director, Virginia Department of Transportation, telephone interview, February 4, 2006. 66 Federal Highway Administration, Highway Statistics 2002, Table SF 21: State Funding for Highways – Summary, available online at http://www.fhwa.dot.gov/policy/ohim/hs02/sf21.htm. 67 Detroit, see ordinances §18-5-60; Ann Arbor, see chapter 14 §1:319 and Lansing ordinances §206:18. 68 U.S. Census Bureau, State and County Quick Facts: Michigan, http://quickfacts.census.gov/qfd/states/26000.html (accessed August 11, 2007). 69 Mackinac Center for Public Policy calculations based on data from the U.S. Census, 2002 Census of Government, State and Local Government Finance. 70 U.S. Census Bureau, Michigan 2002: 2002 Economic Census, Construction, 3. 72 Armand Thieblot, "The Twenty-Percent Majority," 99–134.